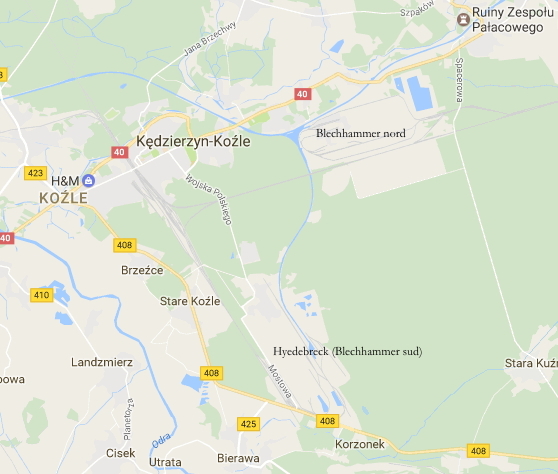 The name Blechhammer is often used to refer to an industrial complex which included associated work camps built in the vicinity of the present-day Polish settlement of Kedzierzyn-Kozle during the Nazi occupation. According to German plans, Blechhammer was to become an important chemical manufacturing plant, specialising in the production of synthetic fuel for the Wehrmacht. The most important company operating at Blechhammer - the location having been specifically chosen for its nearness to the coal deposits of Upper Silesia – was the highly influential I.G. Farben. The factories were to be built on two sites: Blechhammer North and Blechhammer South, the latter often referred to as Heydebreck. The labour force used in their construction was made up of a number of foreign workers1 and a larger group of prisoners of war (British, Russian, French), forced labour (Poles, Ukrainians), prisoners who were to be re-educated through carrying out this work, and Jewish internees. 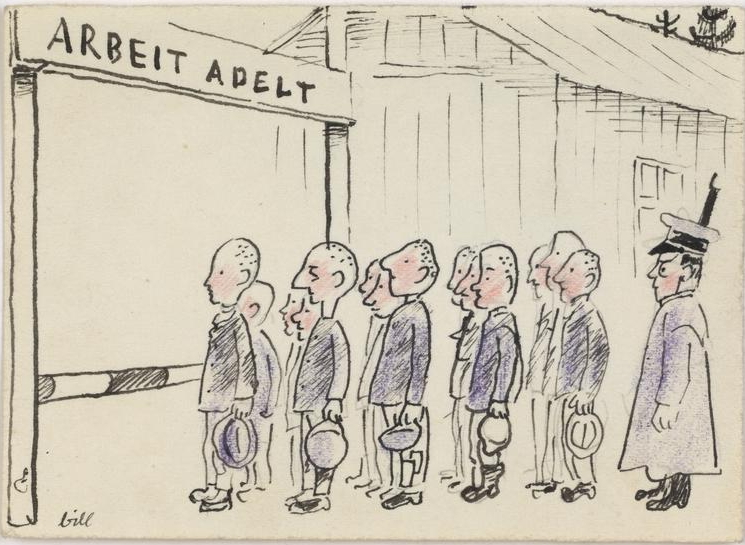 A series of drawings done by a Jewish internee who signed them with the name Bill, acquired by British Prisoner of War who obtained them in exchange for a few cigarettes, vividly bears witness to the presence in Blechhammer of a wide variety of prisoners, each of whom is portrayed in a profoundly different way from the others, yet all whom were being exploited to the same end. 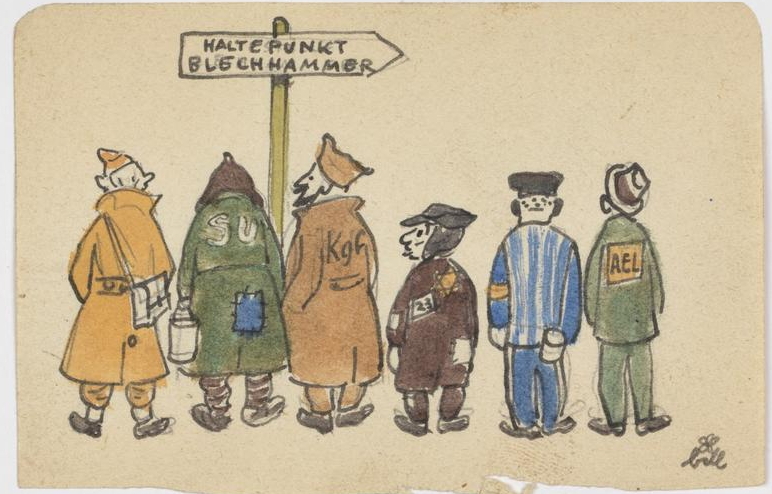 In the above drawing, under the sign displaying the words Blechhammer Station, the following prisoners are depicted from behind (left to right): a British prisoner of war, a Russian prisoner of war, a French prisoner of war, a Jewish prisoner, a prisoner in a striped uniform and a prisoner on whose jacket the letters AEL can be seen. The initials AEL stand for Arbeitserziehungslager, meaning a camp for the re-education of the workforce. According to a British report2 drawn up from evidence gathered from several aerial photographs, at Blechhammer South there were at least two large work camps: the first was located in the south east corner of the site and was made up of 137 huts, the second lay towards the north-west and was made up of a further 106 wooden huts. A similar situation had been photographed at Blechhammer North. On the basis of these calculations the report put forward the hypothesis that around 10 thousand people could have been present. According to some sources at least 40 thousand forced labourers passed through Blechhammer, among whom there were about 5 thousand Jews confined in a camp set aside specifically for them, and about 4 thousand British prisoners of war, some of whom had been transferred to Blechhammer during the summer of 1943 from the prisoner of war camps at Fossoli, Laterina and Sforzacosta. On 22 January 1945 a man named Giovanni Castoldi3 died in one of the Blechhammer camps. Born in Cologno Monzese in 1914, Castoldi worked at Sesto San Giovanni in the Concordia factory belonging to the Falck company. Arrested following the strikes of March 1944, he had been deported in early April from the San Vittore prison in Milan to the concentration camp at Mauthausen. From there, on 2 December 1944, together with other workers deported from Sesto San Giovanni, Castoldi was transferred to Auschwitz. The date of Castoldi's arrival at Blechhammer is unknown: his death took place on the very day in which the Germans, faced with the advancing Russian Army, decided to abandon the chemical production complex. From 21 January 1945 onwards, in fact, all those prisoners still present were evacuated and forced to march for weeks towards other camps lying further to the west. It has been calculated that during these forced marches about 800 Jews may have died. There were also some deaths among the British prisoners of war. 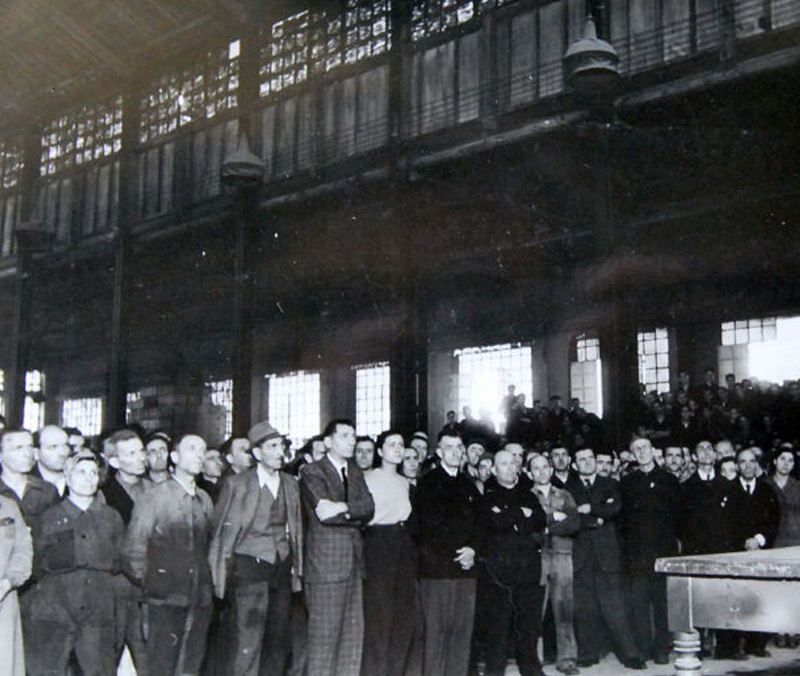 Some Italian companies were involved in building the factories at Blechhammer and Heydebreck, and also the I.G Farben factory at Auschwitz, as a result of a contract signed in 1942 by the Fascist Confederation of Industrialists.